The Bosch GSA18V-083B 18 V Reciprocating Saw is built to easily move through difficult tasks in tight spaces that other recip saws can't fit. It has the best power-to-weight ratio in its class, and delivers a fast 3,050 strokes per minute. At only 15-3/4 In. long and 4.4 Lbs. 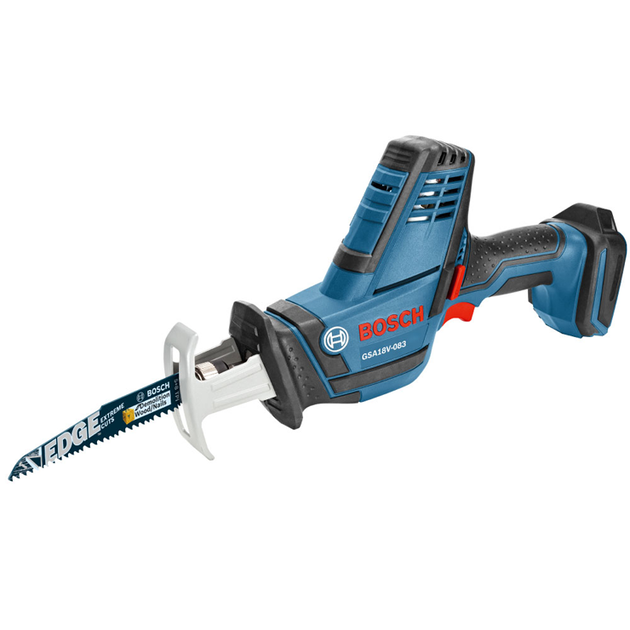 (bare tool), this powerful, compact cordless recip saw provides an impressive 0.83 In. stroke. This allows electricians or plumbers to remove more material per stroke. The tool's light weight is ideal for continuous cutting in over-the-head applications. The easy-to-operate blade-change system allows for fast toolless blade changes, and its LED light helps to illuminate the cutting zone. This tool comes with a lock-out switch, to prevent inadvertent startup of the tool, for added user security. The GSA18V-083B is a bare tool; the battery and charger are sold separately.